This is a wonderful calming and relaxing breath which helps to combat nervous energy. The result is a relaxed system and a clear mind therefore I often use alternate nostril breathing if I need to make a presentation, take a test or have an important conversation where I need to be alert yet relaxed. It can seem a little complicated at first but once you get the hang of it, it will become rote like riding a bike. Come to a seated posture with the spine straight. You can sit on the floor with the legs crossed or in a chair with your feet flat on the earth. 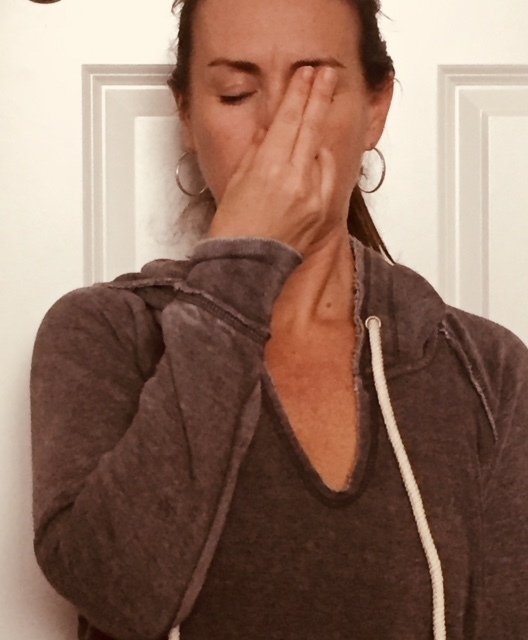 · With your right hand bring you thumb to your right nostril and ring finger to the left nostril, like you are pinching your nose. · To begin, use your thumb to close off the right nostril and inhale through the left nostril. · At the top of your inhale close both nostrils (with the thumb and ring finger) and pause. · Then release the right nostril and exhale. As the body is ready, inhale through the right nostril, close both at the top and pause. · Then exhale through your left nostril. · Again, as the body is ready inhale through the left nostril, close and pause and exhale through the right nostril. Inhale through the right nostril, close and pause and exhale through the left. You have just completed two rounds of alternate nostril breathing! You can continue up to 20 rounds. As you breathe, be sure to keep your spine straight, chest lifted and shoulder blades falling down your back. Fingers are relaxed and simply closing off the nostril, rather than pushing or pinching too hard. As you get the hang of it, let your eyes close down and let the mind focus on the breath going in and out of the body. When you finish, take a few minutes to observe how you feel.